Music is perhaps one of the most universal forms of entertainmentt and to date. Whether on a sentimental level or social; music tends to bind people together and even act as a form of relaxation or therapy. As such there is no surprise that music gadgets are at an all-time high in terms of commercial demands; be it headphones, earphones or speakers. The clearer, high quality music we can access (short of being in the music studio yourself) the better. Music is a term that brings up passion within many, no matter what genre one prefers. So, these are important objects in life, because they can make music a part of our everyday life, just how we like it! Whether you set your favourite song as your morning alarm to add some spring into your step or making sure you have great music playing in the office to keep you upbeat and just downright happy. Our speakers are of such quality that music as well as any audio played using such mediums allow for crystal clear tones. In the allbranded online store you can individualise your promotional products online and use these effectively as your promotional tools. Personalised speakers are particularly effective due to their frequent use and make for high quality promotional gifts. For more variety check out our keyrings, pens, pencils, usb-sticks, mugs, eco-friendly bags, folders and umbrellas. In 1861, the first prototypes were designed as a part of the phone by Philipp Reis. In 1870 Thomas Edison led the first experiments with the phonograph, but they were still far away from today's form. Alexander Graham continued the discovery of Reis, but he also had no breakthrough in the development of the speaker. Only Werner von Siemens was successful: In 1878, he applied for a patent for an electrodynamic speaker. Our modern speakers, as we use them today, were made by physics professor Sir Oliver Lodge in 1898. Promotional items score with your audience when they stand out as original. These are not considered traditional advertising media, but are unexpected promotional products that trigger a special surprise for the addressee, unlike pens, bags or lanyards. Speakers have a special user value and are compatible with radios, televisions or mobile phones and allow the ability to listen to music anytime and anywhere making a perfect promotional phone accessories . With this musical promotional item, you giveaway the gift of music. You can for example mount these to workplaces of your employees or give them away to your customers for special occasions. 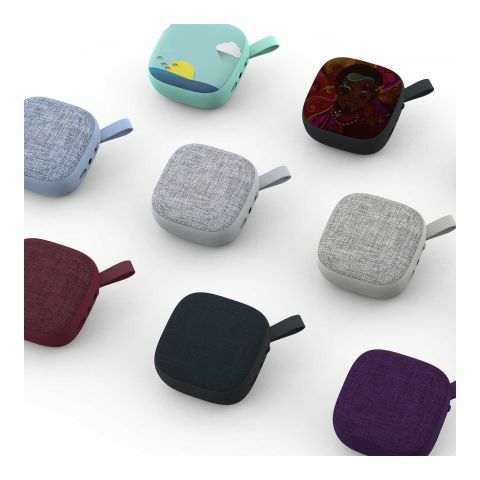 Speakers as a promotional item is especially suited for recording companies or electrical appliance stores, because of the thematic connection. Speakers are products with a long life and are used for a number of years. The longevity of a product automatically improves its advertising impact, because regular use creates memories. Brand impressions are generated and increases the awareness of your company, also achieved with our range of promotional headphones , pens, pencils, usb-sticks, mugs, eco-friendly bags, folders and umbrellas. Moreover, the music that is played with your speakers, will remind them of your promo product and your business. As such, you'll not only increase the popularity of your business, but you can also strengthen the bond with your target groups. Use these as your advertising medium in order to advertise for your business with music and originality! Our range are available in various sizes and designs in the allbranded online store, wireless connected via bluetooth or usb-connected forms. The following applies: The smaller the size of a speaker, the higher the tones to be reproduced. Speakers of different sizes form an acoustic system. When choosing, you should pay particular attention to the quality. A current trend is portable mini-speakers. They can be connected to music sources and are portable and flexible in nature. They are environment-friendly, since they operate with batteries, and have a very lightweight and compact design and are perfect when combined with promotional promotional iPhone & mobile phone product we offer in our web shop. So, choose your musical advertising according to the needs of your target audience and the allbranded service team will happily assist you at any point of the process!